Schneider Electric provides knowledge on new technical and technological developments in the electrotechnical field and electronics. They also provide better understanding of various phenomena observed in electrical installations, systems and equipment. Each “Cahier Technique” provides an in-depth study of a precise subject in the fields of electrical networks, protection devices, monitoring and control and industrial automation systems. Under Electricity distribution, the Group offers electrical products such as circuit breakers, switches, safety lighting, prefabricated busbar trunking, modular switchgear, Power Line Carrier communication networks and Voice-Data-Image solutions. Under Automation and Control, the Group offers products to control and supply power to equipment such as contactors, overload relays, soft starters, speed drives, sensors and operator terminals. Schneider Electric also offers configuration, programming and operating support software, communication networks and field buses. Under Secured energy, the Group offers APC’s UPS systems. Schneider Electric operates mainly in Europe, Asia Pacific and North America. In 2008, the Schneider Electric acquired ECP Tech Services, Marisio, Wessen, RAM Industries, Xantrex and American Power Conversion (APC). 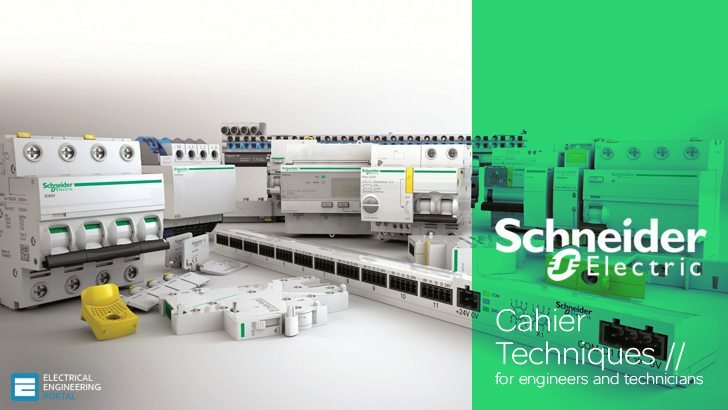 In past 20 years Schneider Electric released around 70 technical publications related to electricity and automation, and these publications are listed below. 1 Active harmonic conditioners and unity power factor rectifiers . 2 Analysis of three-phase networks in disturbed operating conditions using symmetrical components . 3 Automatic transfering of power supplies in HV and LV networks . 4 Basic selection of MV public distribution networks . 5 Behaviour of the SF6 – MV circuit-breakers Fluarc for switching motor starting currents . 6 Breaking by auto-expansion . 7 Calculation of short-circuit currents . 8 Calculations for LV and HV networks . 9 Cohabitation of high and low currents . 10 Control equipment for MV capacitor banks . 11 Control-monitoring and protection of HV motors . 12 Current transformers – how to specify them . 13 Current transformers – specification errors and solutions . 14 Current transformers for HV protection . 15 Data acquisition – Detection . 16 Dependability and LV switchboards . 17 Dependability of MV and HV protection devices . 18 Design and use of MV current-limiting fuses . 19 Development of LV circuit breakers to standard IEC 947-2 . 20 Directional protection equipment . 21 Discrimination with LV power circuit-breakers . 22 Disturbances in electronic systems and earthing systems . 23 Dynamic stability of industrial electrical networks . 24 Earthquakes and electrical equipment . 25 Electric motors… and how to improve their control and protection . 26 Electrical disturbances in LV . 27 Electrical installation dependability studies . 28 Electrodynamic forces on busbars in LV systems . 29 Electronic starters and variable speed drives . 30 EMC – electromagnetic compatibility . 31 Enclosures and degrees of protection . 32 Energy savings in buildings . 33 Energy-based discrimination for low-voltage protective devices . 34 Extra losses caused in high current conductors by skin and proximity effects . 35 Fault arcs on busbar sets and switchboards . 37 From current transformers to hybrid sensors, in HV . 39 Harmonic disturbances in networks, and their treatment . 40 Harmonics upstream of rectifiers in UPS . 41 High availability electrical power distribution . 42 HV industrial network design . 43 Integration of local power generation in industrial sites and commercial buildings . 44 Intelligent LV switchboards . 45 Introduction to dependability design . 46 Inverters and harmonics (case studies of non-linear loads) . 47 Lightning and HV electrical installations . 48 LV breaking by current limitation . 50 LV circuit-breakers confronted with harmonic, transient and cyclic . 51 LV protection devices and variable speed drives (frequency converters) . 52 LV surges and surge arresters LV insulation co-ordination . 53 MV public distribution networks throughout the world . 54 Neutral earthing in an industrial HV network . 55 Overvoltages and insulation coordination in MV and HV . 57 Power supply of lighting circuits . 58 Protection of electrical distribution networks by the logic selectivity system . 59 Protection of industrial and tertiary MV networks . 60 Protection of MV-LV substation transformers . 61 Residual current devices In LV . 62 SF6 properties, and use in MV and HV switchgear . 63 System earthings in LV . 64 System earthings worldwide and evolutions . 65 The behaviour of SF6 puffer circuit-breakers under exceptionally severe conditions . 66 The IT system earthing (unearthed neutral) in LV . 67 The singularities of the third harmonic . 68 Thermal study of LV electric switchboards . 69 Uninterruptible static power supplies and the protection of persons . 1 Coordination and protection of busbar distribution . 2 Ground Fault Protection . 3 Increasing availability of LV electrical networks . 4 Coordination of LV protection devices . 5 Lighting Technical Guide . 5 Loading Considerations When Paralleling Power Transformers . 6 Designing a metering system for small and medium-sized buildings . 7 MV Network Design Book With Exercises and Answers . 8 Electrical Network Design For Efficient Wastewater Treatment Plants . 9 Guidelines To Data Center Commissioning . 10 Medium voltage switchgear application guide (transformers, motors etc.) . 11 Panel builder design guide for LV power factor correction cubicles . 12 Testing specifications for preventive maintenance of electrical equipment . 13 Control Panel Technical Design Guide (EMC Protection and Panel Wiring Tips) . Many Thanks to you and you for compiling these articles which are so informative and useful. I ma studying electrical engineering at French South African Schneider Electric Education Center. I use Schneider Electric components they are very interesting and eventually making life simple. Hope i will, one get employed at Schneider Electric. Yes indeed! SEPAM is good protection relay with bunch of possibilities. However, maybe I will publish some technical article about SEPAM relays with info and catalogue or paper for download. Thanks fot the tip Mirjani! Yes,I support Mirjani.SEPAM Relays,from my experience are one of teh best relays I have ever seen. I am currently working at Schneider Electric. All documents on this website are very interesting and helpful with me. For the SEPAM relay, If you need any document please let’s me know.